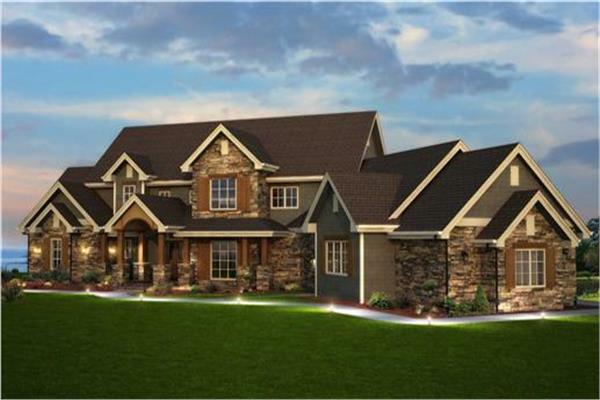 Whether for frequent overnight guests or dedicated hobby space, 5+ bedroom house plans afford the greatest level of flexibility with the grandest level of style. Building a home with five or more bedrooms provides a near limitless number of options for design and decoration, especially when it comes to deciding the purpose of each room. Many homeowners choose 5+ bedroom home plans to accommodate a large or growing family, allowing them to create a forever home that they can actually live in forever. Once the kids move out, the extra rooms are easily converted to suit a variety of functions without the hassle of having to take on a cumbersome addition. Some homeowners choose big house plans to ensure space for specific needs right from the get-go. This can include a designated office space in the floor plan for a home business, a fully functioning private gym, or a dedicated media room. Thanks to the versatility of large family house plans, homeowners can also quickly react to unexpected living situations, such as an elderly parent or an unexpected visitor moving in. The additional rooms can stay as permanent guest rooms, waiting for the next visitor, or transform into one whenever the need arises. Because 5 or more bedroom house plans are by nature large, they will commonly include many windows and expansive common areas. It’s common for these plans to feature a grand dining room and a sizable kitchen space to account for the higher number of occupants. It’s also common for these homes to have a finished basement where a bedroom or two may be located. As with any luxurious homes, many of these floor plans also feature amazing master suites that include private baths with additional luxuries. They also offer multiple bathrooms, so owners never have to worry about a backup in the morning or an inconvenience while entertaining. Browse through the plans below, and don’t hesitate to reach out with any questions you may have.